Color some of the pancake batter using varying shades of pink food coloring. Pour pancake batter into squeeze bottles. Spray a non-stick griddle with cooking spray. Use a paper towel to evenly distribute the spray over the surface of the griddle. Pipe the outline of each design onto the griddle. Add details using more colored batter. Allow the design to dry for a few minutes, and then pipe on the fill color. Set griddle over medium low heat. Cook pancakes for about 5 minutes until bubbles appear then begin to burst on the topside of each pancake. Flip pancakes over and continue to cook until golden brown on the backside, about 5-7 minutes. Once pancakes are cooked through, remove from skillet and serve, or keep warm in a 200°F oven until ready to serve. You can prepare these pancakes ahead of time, keep them refrigerated, and then reheat in a warm oven before serving. 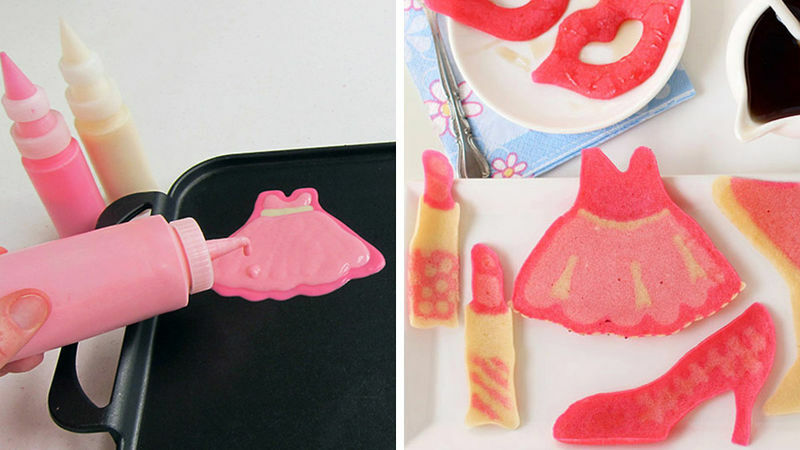 With just a squeeze bottle and your favorite pancake batter, you can draw your breakfast and eat the results! Pancakes are not by nature pretty. The sweet breakfast cakes are sure tasty, but they usually aren't terribly good looking. Round and flat is the norm. But they don't have to be so ordinary looking – they can be festive and colorful! Recently I made a batch of pretty pink pancakes to show support for Breast Cancer Awareness Month. I had my friend, a breast cancer survivor, over for breakfast, and she really loved her special treat. They would also be a great addition to a bridal shower brunch menu or girl's weekend breakfast. And now that I've mastered pancake art, I plan to make them more often! I chose really simple feminine designs like purses, handbags and high heel shoes. To make sure I had plenty of time to draw my designs, I put my pancake batter in squeeze bottles and piped the batter onto a cold griddle. I was able to sit at my kitchen table and leisurely create my pancakes. When I had them looking pretty good, I put the griddle on the stove and cooked them. I got them all made and kept them in a warm 200-degree oven until my friend arrived. When I put them on the table, they really made an impression! To make your own edible art for breakfast, you'll want to whip up your favorite pancake batter (you can make it from scratch or use Bisquick pancake mix), making sure it's thick enough to hold its shape when piped. Color the batter using food coloring, then pour it into squeeze bottles. Get your griddle ready by spraying it with some non-stick spray. You don't want puddles of oil on your pan, so take a paper towel and rub the oil into the pan. Get creative, drawing whatever you'd like using your pancake batter. Pipe on one color, then let it dry just a bit before piping on another to keep the colors from bleeding. If you draw the outline of one design then move on to the next, by the time you get that one done, you can go back and add another color to the first design. Layer the colors to create some really fun designs. I love polka dots and used them on several of my pancakes. Make sure you leave enough room around each pancake so you can easily flip it over. You can see here the blobs I was talking about. I made more lips and ribbons (which turned out much better than those pictured here). Carefully move the griddle onto the stovetop and turn the heat on medium low. You want to cook these slowly so the pancakes don't brown too much on the topside. Cook for about 5 minutes, until lots of bubbles form and begin to burst on top of the pancakes, then flip them over. You'll want to cook them a bit longer on the flip side, until they turn golden brown – then they're ready to serve. Before you make another batch, allow the griddle to cool. Serve up with a little syrup and enjoy! Beth happily spends her days creating fun food and handmade chocolate and enjoys sharing step-by-step tutorials with her readers on her blog, Hungry Happenings. Be sure to check out her profile to see all the other festive foods she's made for Tablespoon.com.